Warning: the Wireless LAN Controller Network Module (NM-AIR-WLC6-K9) is not supported in any software release after 4.2.209.0. Attempting to install 5.0 or later software can permanently damage the module. This is a pretty recent addition and appears to have been an oversight the past year or so while they’ve been happily releasing version after version of NMWLC code without this disclaimer. If you’re like me, you’ve been keeping up on your latest and greatest software releases and you may find yourself in some murky waters if you happen to have this module. Where I landed was a module that would boot fine, but would not establish any network connectivity (management, AP join, etc). You should note that this article in it’s entirety does not apply to the NME module, just the NM. The NME module has more memory and a 1G internal interface to the ISR, the regular old NM has less memory and only a 10/100 interface. You can tell which module you have by looking at the silkscreen on the back of the module or by doing a ‘show sysinfo’ at the CLI of the controller. This article is not supported by Cisco, TAC, or myself. You may further damage your NM if you proceed. This article is not for the faint of heart and will most certainly void any warranty you may have. If you have a bricked NM under SmartNET, you should contact TAC for a replacement unit, not follow the directions in this post. I do not guarantee any work here and you can severely damage your module, it’s flash, or your PC. Read and follow this article at your own risk! The first thing I did was to remove the CF module from the donor NM. 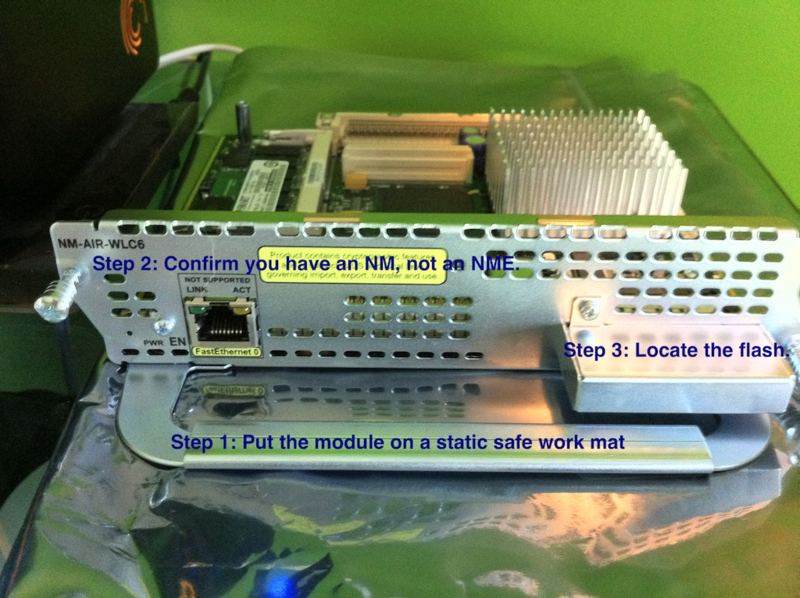 Step 1) Place the donor NM on a static safe work place. The bag it came in would be good. Step 2) Confirm that the module you’re working on is an NM, not an NME. Step 3) Locate the cover that hides the flash module. You must then remove the protective cap around the flash module. 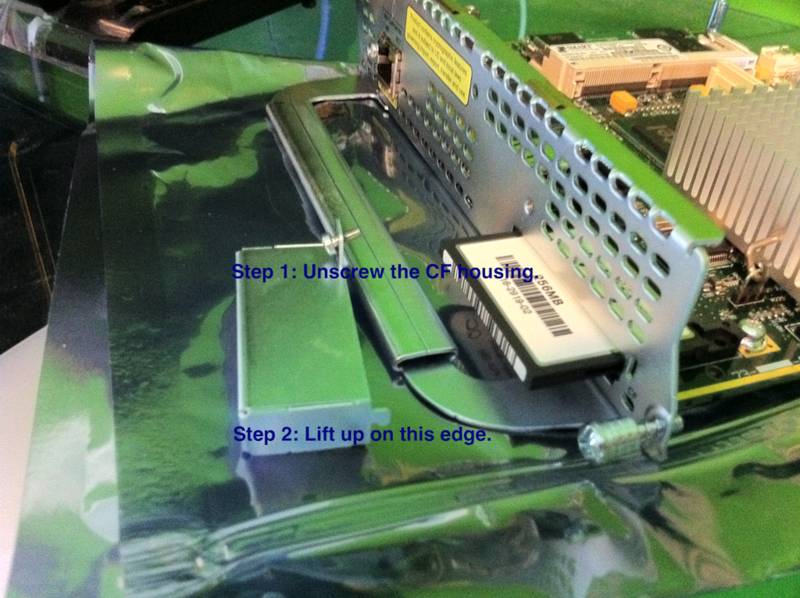 Step 1) Unscrew the CF housing. Step 2) Lift up gently on the right edge of the cap and it should fall off the module. 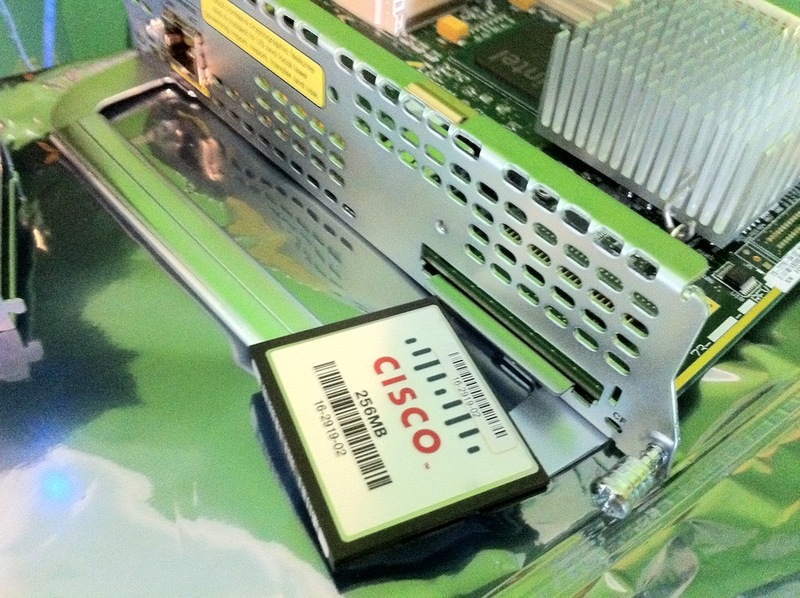 Gently grasp the Cisco flash module by both edges and pull it directly out of the NM. Insert the flash module into your CF reader. Once you’ve successfully booted Linux, you’ll need to open a terminal window. In DSL, there is a link to the Terminal app in the bottom left corner. Attach your USB drive and insert your PCMCIA flash reader once your system is booted and your terminal is up. <6>cs: memory probe 0x60000000-0x60ffffff: clean. -dd is the name of the application we’re going to use to take the image. -if=/dev/hde tells dd that the input file is the device of /dev/hde (our CF). -of=/dev/sdb1/nm.image tells dd that the output file is a file on our USB drive called nm.image. This will take some time since we’re reading the CF block by block and writing it out to the USB flash drive. The resultant image will be the same size as the CF (257M in this case) since it’s copying everything – data, unused bits, partition info, etc. 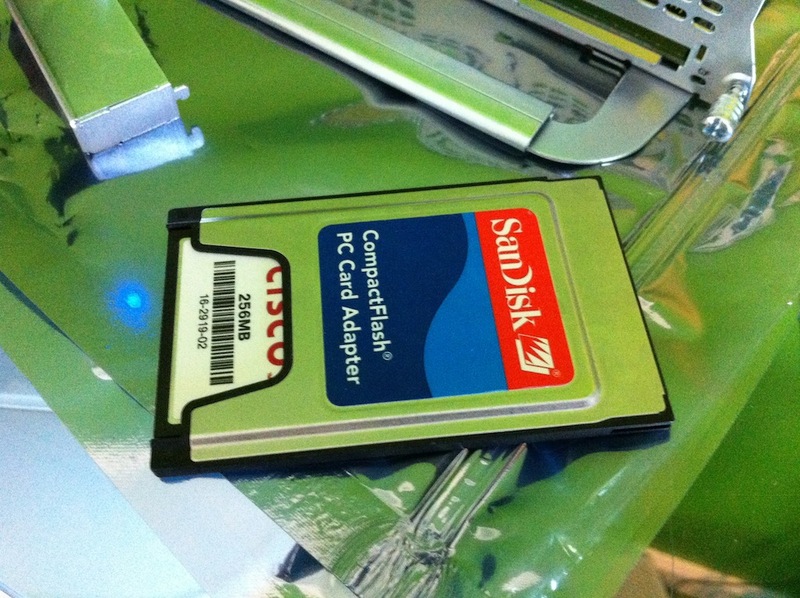 Eject the CF adapter and re-install it into your donor NM following the instructions in reverse. Once you’ve put away your good hardware, shutdown your ISR with the bad NM, remove it out of the ISR, and extract the flash out of it as described above. Insert it into your CF reader as described above, boot your laptop as described above, insert your devices (USB and CF) into the laptop as described above, and open the terminal application as described above. -This gives you a dump of system messages. Look for your USB device and CF device like you did before and confirm they’re there. -if=/dev/sdb1/nm.image tells dd that the input file is a file on our USB drive called nm.image. -of=/dev/hde tells dd that the output file is the device of /dev/hde (our CF). to confirm that your module boots successfully. One of the more obvious side effects of this is that you’ll loose your NM configuration and you’ll have your donor NMs configuration now on yours. You’ll want to watch the card boot and do a clear config first off to ensure you have a good starting point. If you don’t have a donor NM to get this process done, you may want to look around to see if anyone else in your situation has the data bits from the dd process above. Once you have an extracted image, this should work on any of the like platforms regardless of where it came from.